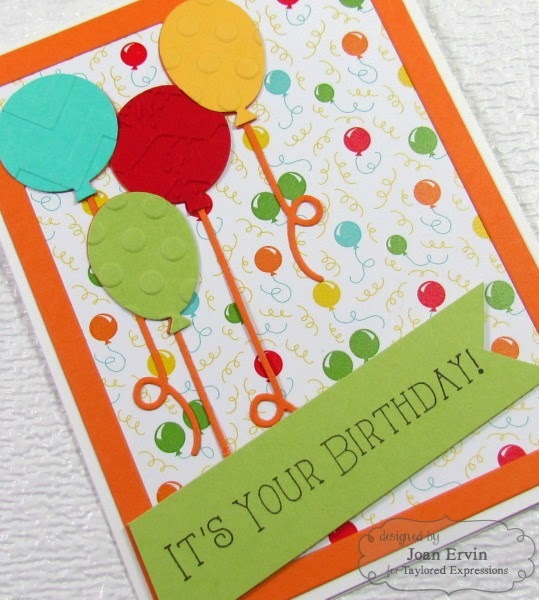 · It’s TE’s sixth birthday! And what would a birthday be without a few birthday cards!!!! 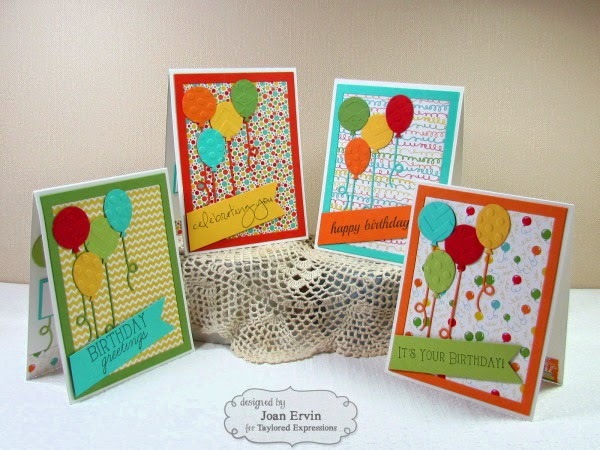 This birthday card set was created with the new TE Up, Up, and Away Cutting Plate...papers from the Matched Double the Fun 6x6 paper pack and several colors of the Matched Cardstock were used: Granny Smith, Peapod, Cherry Pop, Pumpkin, Cookie Monster, Sugar Cube, and Lemon Meringue. 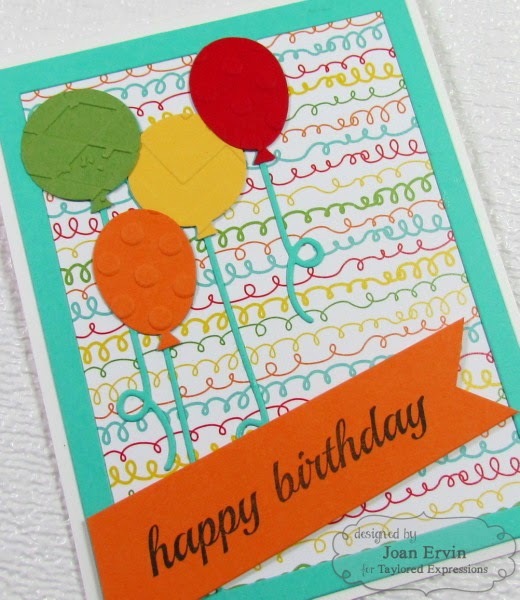 The balloons were all embossed with three of the new TE Embossing Folders: Harlequin, Zig Zag, and Lots of Dots. 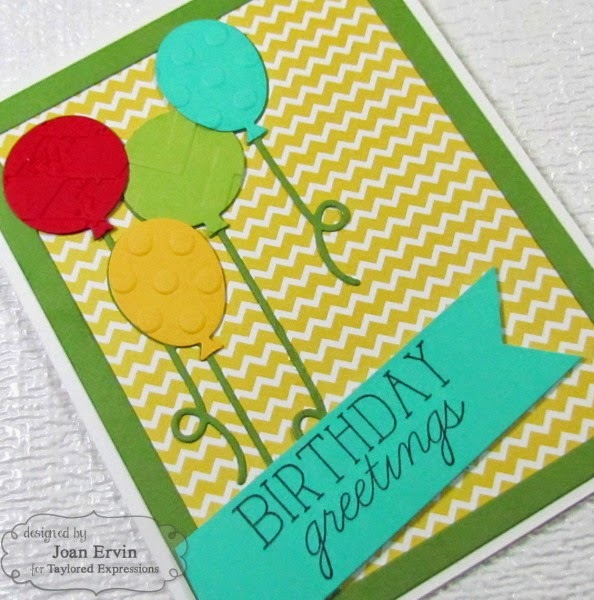 Papers from the Matched Double the Fun 6x6 paper pack were used on the insides along with Matched Cardstock. Don't you just love the new Matched Double the Fun papers....they are all so bright and festive!! 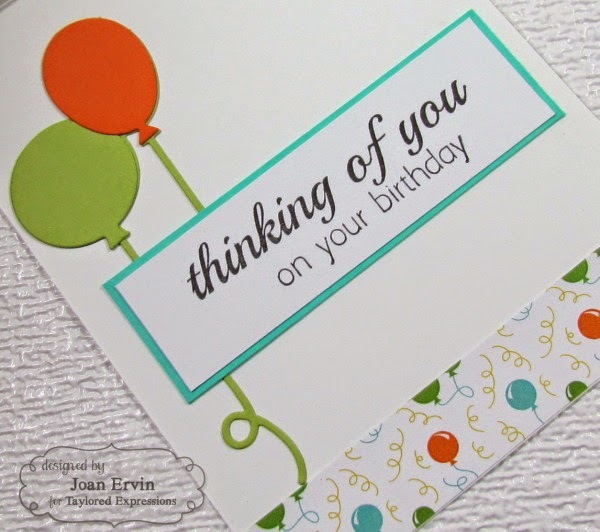 The In and Out Birthday stamps are wonderful, too...they have several different fonts and a sentiment for everyone!! 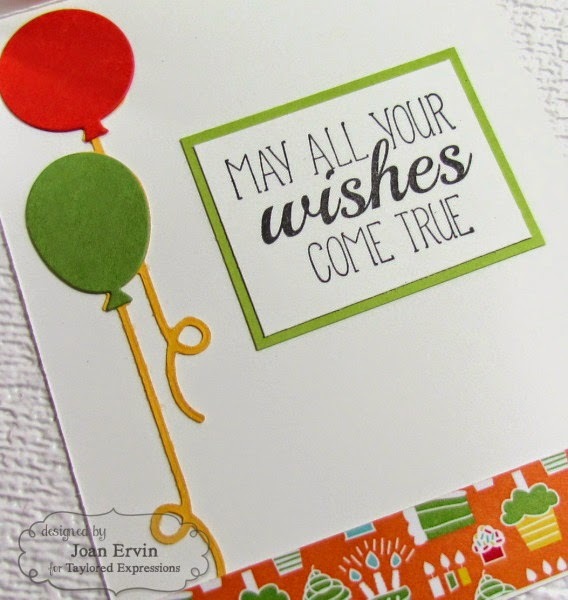 with all the bright colors and pretty papers, no embellishments were needed!! Now, how about a Halloween Party!!!! 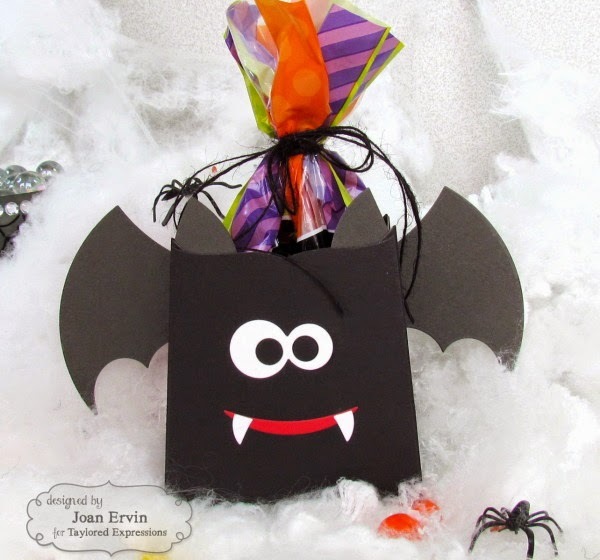 Don't you just love the little Sack It - Bat....he is just perfect to hold a bag of Halloween Treats!!! The Sack It To You die was used as the base for the Bat....I love those goofy eyes!!! Choice Black was used for the Sack It To You bag and this bat has a red mouth. I should have added a bow to this one to make her girly. 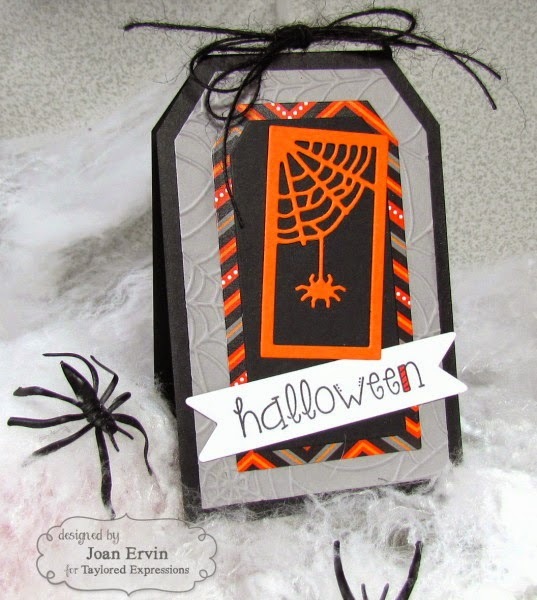 This set of cards and the tags feature the fun and sooo cute You've Been Framed - Halloween dies.....such adorable Halloween scenes!! 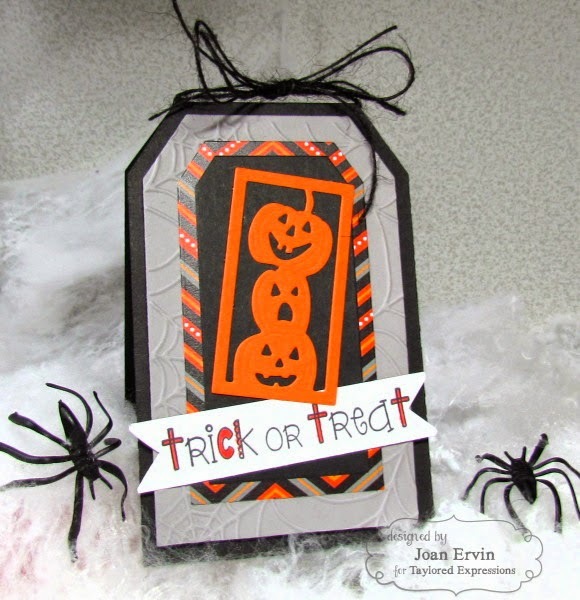 and the gray layer was embossed with the new TE Tangled Web Embossing Folder. 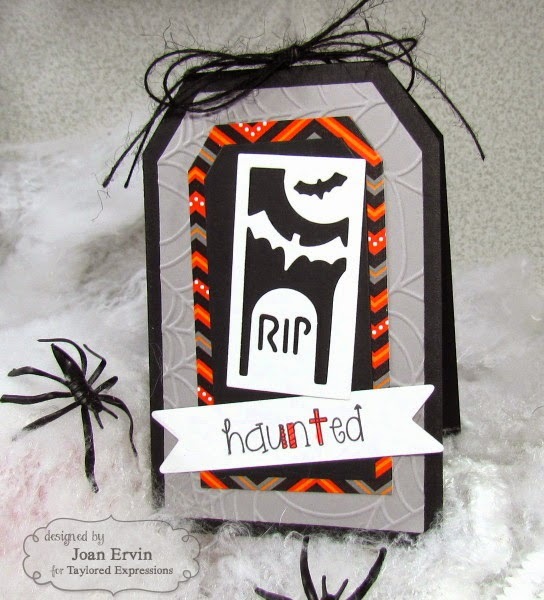 and the sentiments are from the new Little Bits of Halloween stamp set. The previously relelased Pockets and Pages (What a Day) die was used to cut the banners for the sentiments. 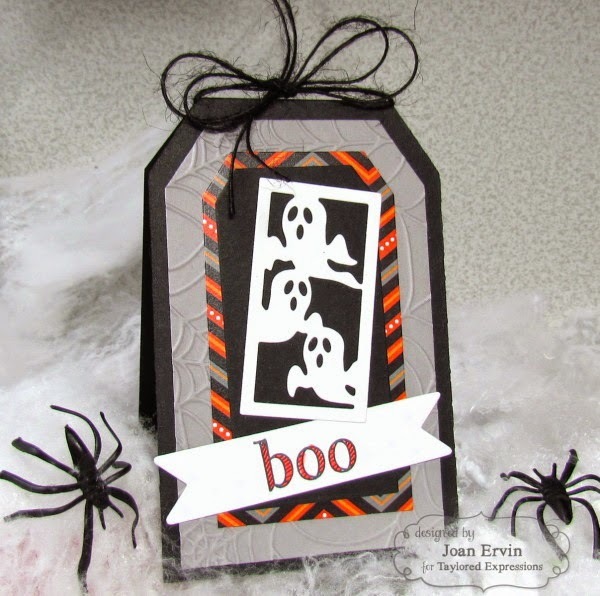 The tag bases were also cut with the Tag Stacklets 2 and the You've Been Framed - Halloween dies were used for the little Halloween scenes. 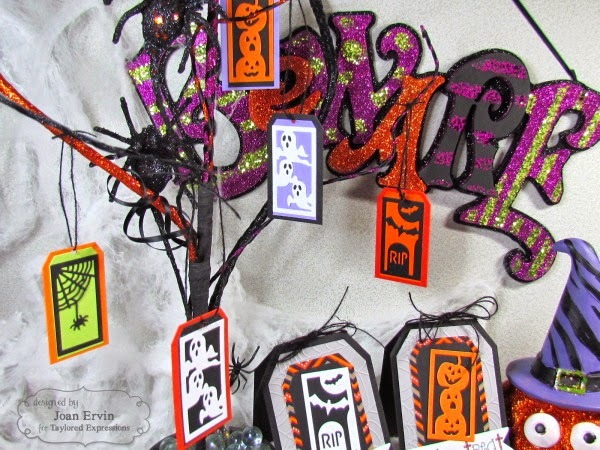 I used the tags to hang from my Halloween tree but they could also be used on gift bags...super fun!!! Thanks for visiting, crafty friends! If you'd like to see more projects and new product information, please head over to the TE Blog for a complete blog roll of our participating designers! Remember....tomorrow is the Taylored Expressions September Release....7:00 AM PST....WOOT!!! 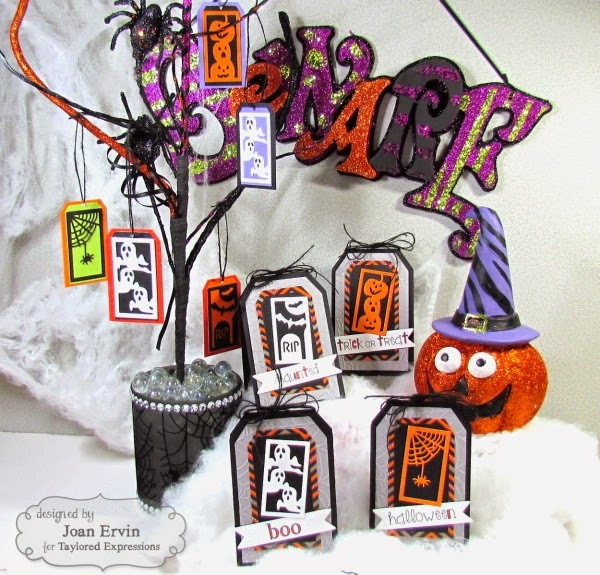 What a wonderful selection of fun, fun projects Joan! 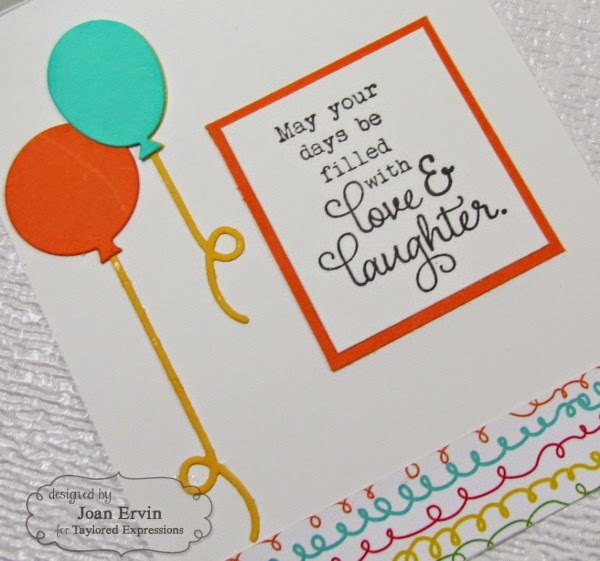 Love all of the cheery colours in your birthday set, those PP are yum! 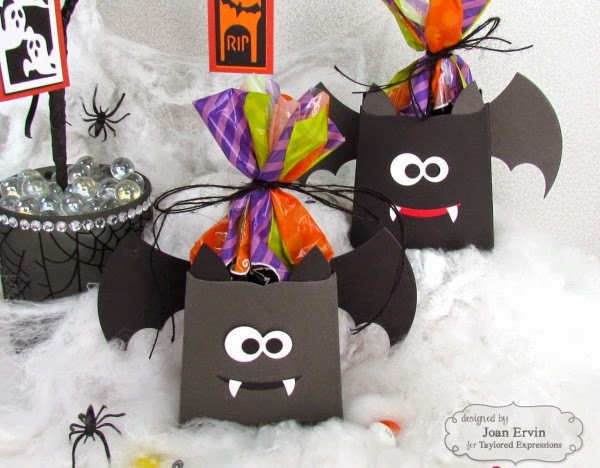 The bats projects are adorable! 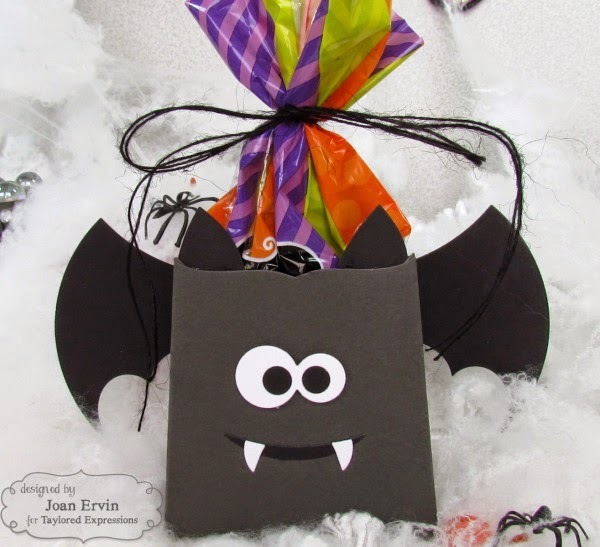 Love the Halloween party and all the fun things you've made Joan! the Tree and the tag cards and the goodie bags! And I love the birthday cards too! What a fun way to celebrate TE's 6th birthday! 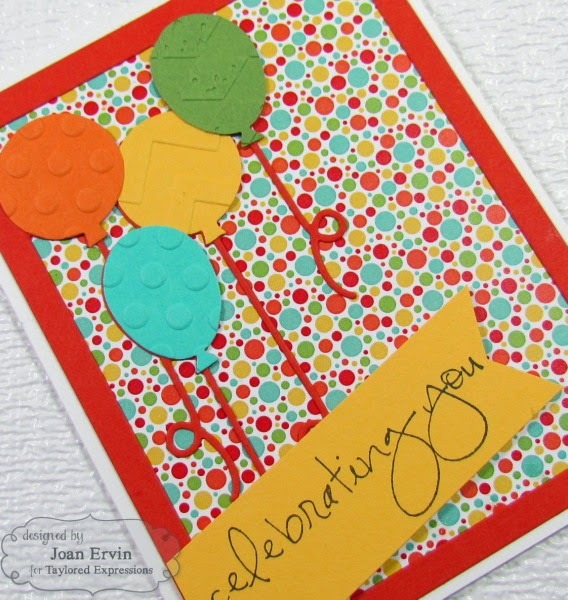 Hi Joan wow what stunning creations!! love the bold colours and layouts!!! Oh wow, what fabulous creations, especially the tags! 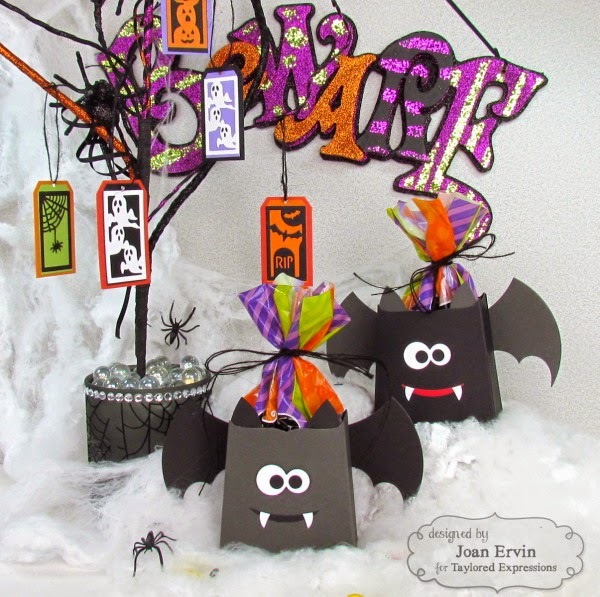 Love the bat boxes too and all the balloons, just awesome! I guess I'm crazy about it all! 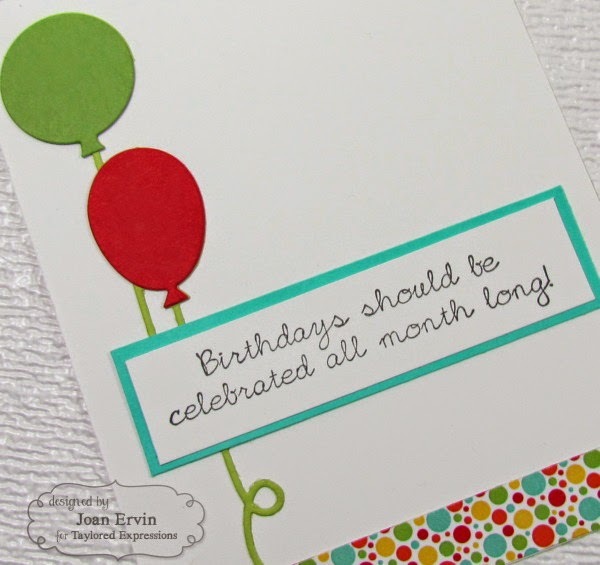 I love the fun, festive birthday cards! So cute!